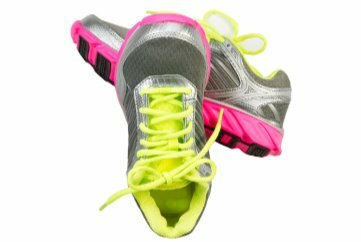 Research shows that planning your exercise routine around your menstrual cycle boosts its benefits. Women who do anaerobic (strength-training) workouts during the first half of their cycle create more muscle. Women who do aerobic (cardio) workouts during the second half of their cycle burn up to 30% more fat. If you’re a woman who exercises or plans to, there’s something important you should know: The hormones in your menstrual cycle can speed up your exercise results! That’s not all: This hormonal benefit applies to both anaerobic (strength-training) and aerobic (cardio) exercise. And, get this—you don’t even have to work out harder or longer to reap the workout-boosting benefits! You simply have to time your workouts around your menstrual cycle. Yup, that’s it! Keep reading because I’m going to show you how easy it is sync your exercise regimen with your cycle to boost your results…. Want to build muscle in your legs, arms, buttocks or other body areas more quickly? During the first half of your menstrual cycle (from the first day of your period through ovulation), focus more on anaerobic exercises, which are the kind that build muscle. These can include using weights, stretching resistance bands, doing isometric exercise and climbing stairs. 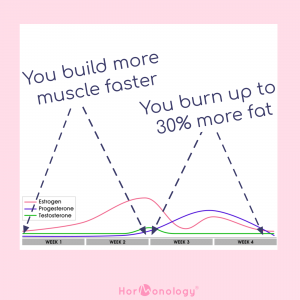 Research shows that you build more muscle and build it faster on these days in your cycle thanks to rising estrogen. (1,2) As this hormone steadily climbs between the first day of your period and ovulation, it speeds and enhances muscle repair. Looking to torch fat fast? During most of the second half of your cycle (from the day after ovulation through a few days before your next period), focus more on aerobic exercises, which is the kind that speeds up your heart rate and makes you breathe a little heavier. These can include speed walking, running, jumping rope, biking, swimming and even dancing. 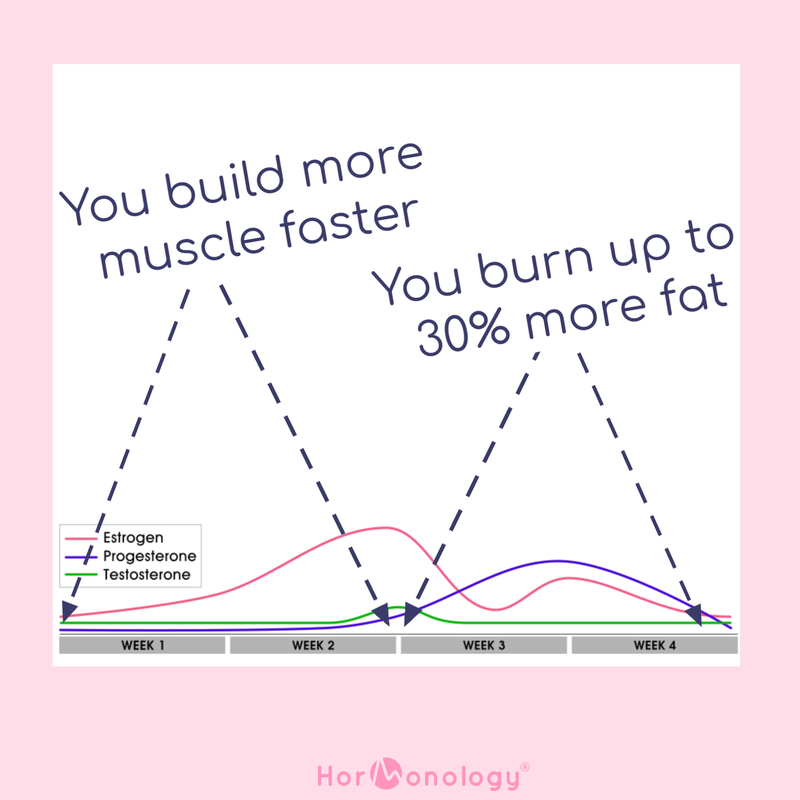 Research shows that you burn up to 30% more fat during aerobic exercise on these cycle days thanks to a combination of estrogen and progesterone. (2,3) These hormones work together to help the body use fat as fuel when you’re active. More good news? Aerobic exercise feels easier to do on these days in your cycle because this hormone combination reduces the production of fatiguing lactic acid that builds up in muscles as you exercise. While it’s helpful to know which half of your cycle produces quicker muscle-building results when doing strength-training and which half produces greater fat-burning results for cardio, it’s smart to incorporate this information in a healthy way. This means not pushing yourself further than your body wants to (or should) go so you can avoid injury and pain. It also means mixing up your workout routine so that you’re continuing to do both strength-boosting and cardio all cycle long. That’s because both types of workouts have proven benefits for overall health. Drink coffee before your workout: Not only does caffeine in coffee give you an extra energy push that makes aerobic exercise easier, ingesting caffeine before your workout helps you burn more calories as you exercise and for three hours following it. (4,5) What’s its secret? Caffeine helps the body metabolize fat more quickly and use it ahead of carbohydrates for fuel. Load up on protein: Whether you’re a carnivore or herbivore, simply eating more protein throughout your day (up to 30% of total daily calories) in conjunction with regular anaerobic workouts improves muscle growth and strength, according to a 2017 study in The American Journal of Clinical Nutrition. (8) Regardless of whether the protein you consume comes from animals (such as meat, poultry, fish or eggs) or plants (such as beans, peas and tofu), it delivers amino acids and other nutrients that are essential for muscle growth and repair. I’d love to learn more–sign me up!